We can remove your old vinyl floors for you. Vinyl flooring has been a popular domestic and commercial flooring choice for over 50 years because it is durable, low maintenance and cheap relative to other flooring products. Whether you are replacing damaged or tired flooring, or you’ve finally had enough of your hideous kelp-green 1980’s kitchen floor, we have the team and the expertise to successfully remove this complicated flooring. How is vinyl flooring removed? Removing vinyl flooring is usually quite difficult, because the majority of domestic vinyl flooring is laid on a subfloor of hardwood or plywood. Because wood is porous, over time it absorbs the adhesive and this can make removal difficult. Vinyl flooring can also have a paper backing which bonds with the adhesive and wood, making it laborious to remove. Other vinyl floors are laid on concrete and while these may be a little simpler to remove, often the adhesive will need to be ground down to create the very smooth finish that reinstallation requires. Here is how we would tackle your difficult vinyl floor. First we’d need to identify what kind of subfloor is beneath the vinyl, because the method of removal will vary based on this information. The removal of the actual vinyl is the same. First, we’d use scrapers and knives to remove the vinyl. Then, if you have a wooden subfloor, we’d remove any paper backing and adhesive with belt sanders, scrapers and possibly heat guns. If you are reinstalling vinyl flooring we would need to ensure that the wood is smooth, as vinyl flooring requires a very smooth reinstallation surface. If the subfloor is concrete, we would use a diamond floor grinder to grind off the adhesive, and if you are reinstalling vinyl flooring we would add a “skim” or “feather” coat to make sure that the concrete is totally smooth. Finally, we would clean and vacuum the floor so that it is ready to go for reinstallation. What services do we offer for vinyl flooring? Why do I need professional help to remove my vinyl floors? This type of home renovation should always be done by professionals. There are several reasons for this. Firstly, if there is a more laborious or fiddly home renovation job, we can’t think of it. Removing the adhesive (especially from valuable hardwood subfloors) takes time and skill. While damage to the floors may be inevitable due to the extremely strong adhesive bonds, our team are experts at minimising this damage. Removing vinyl floors also requires knowledge of specialised tools such as mechanical scrapers and heat guns. Using a heat gun incorrectly can set vinyl backing paper alight. Re-laying a vinyl floor also requires a very smooth and well finished subfloor. 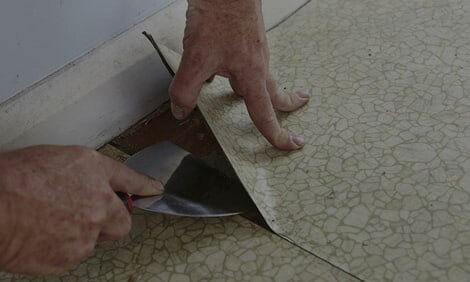 Finally, the backing of some vinyl and linoleum floor coverings can contain asbestos. We know the type of houses this is common in and how to deal with this type of flooring safely. We know every trick in the book when it comes to domestic vinyl flooring and that’s a good thing, because there are a lot of them! We are one of the leading Melbourne vinyl floor removal operators, because we combine years of experience with an unwavering dedication to making your home renovation project a seamless end-to-end experience. We can give you a free quote right now if you fill out the quick and simple form on the right-hand side of the page. So does removing your vinyl floor sound like a headache? It is. But let it be our headache and not yours.